Tape over your dance floor perimeter edges with this Gaffer dance floor tape to prevent shifting of the edges. Remove without leaving messy residue behind. Size: 2" wide x 180' long. Available in: Black, White, or Gray to match the selected top surface color of your matlay dance floor. Helps the perimeter of matlay flooring adhere to the subfloor, especially if subfloor is not perfectly smooth. Gaffer Tape is high quality, strong, cotton cloth tape with excellent adhesion. Cloth gaffers tape can be removed cleanly without leftover adhesive. 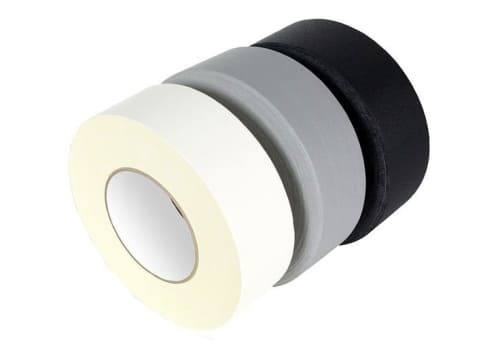 Tape over your dance floor perimeter edges with this gaffer dance floor tape to prevent the entire floor from shifting. Once your floor is ready to be laid down, just follow these dance floor taping instructions to complete the last step. Helps the perimeter of matlay flooring adhere to the subfloor, especially if subfloor is not perfectly smooth. Use vinyl tape to tape across the seams of your dance floor rolls. Removes without leaving messy residue behind.